One reader even declared Hope for Her, her favorite book this year. Considering it’s October, I thought that was pretty cool. haha. Hope for Her will be .99 cents for another 10 days! October 6, 2014 (Tonight) from 4:00 – 8:00 pm CST, I will be taking over at the United Indie Book Blog on Facebook. Lots of great giveaways and I will share some exclusive excerpts from Hope for Him (Hope Series Book #2). Come and join me. October 9th, 2014 from 4:00 – 8:00 pm CST – The New Adult Street will be taking over at the Twin Sisters Rockin’ Book Reviews on Facebook. October 30, 2014 from 10:00 am – 10:00 pm CST – Trick me or Treat me? Romance Book Lovers Halloween Party. Join The New Adult Street Team for great giveaways and fun halloween activities. Costumes optional. Edits for Hope for Him (Hope Series Book #2) are due to my editor no later then October 15th. The final 30,000 words on Hope for Us (Hope Series Book #3) due on November 1st. Guess what, the book is about a girl and a football player. Big surprise. “Change your world.” His advice to a troubled young lady. “Old man got to be the old man. Fish got to be a fish.” His take on the classic novel, The Old Man and the Sea by Hemingway. “Hit it on something stupid.” As to why he had cuts and bruises on his knuckles. “When you pray for the rain, you have to deal with the mud, too.” Great advice to anyone. “Progress, Not Perfection.” Advice to his coworker. 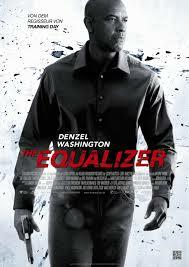 Have you seen the The Equalizer? What was your favorite part? Are you participating in NaNoWriMo next month? Have a great October, everyone! Previous White Lady by Jessica Bell – Release Day! Denzel has a way with lines. That’s awesome your book is doing so well!